When Apple released Aperture 2, the general sentiment about all the new features in this professional photo management program was one of excitement—and puzzlement, because of how long it took for a major upgrade from Aperture 1.5 ( ) to appear. Version 1.5 was released over a year ago, and during this interval, the professional photographers and advanced amateurs who use Aperture settled for the small updates to 1.5, and at the same time grumbled for a major update. In the meantime, competitors such as Bibble and Adobe Lightroom ( ) got the attention of many photographers. Aperture 2.0.1, however, is the program photographers wanted all along—when you use the new Aperture, it’s obvious that Apple listened its users. The new version features added tools, a streamlined interface that is both familiar yet tweaked for a much better workflow, and improvements in workflow-related speed (loading images, rendering adjustments, toggling between views, etc). To top it off, Aperture’s price drops from $299 to $199 ($99 to upgrade). Aperture’s updated interface cuts down on the clutter and is a pleasure to use. The Projects, Metadata, and Adjustments Inspectors are tabbed and take up less space than in previous version, which leaves more room for actually working on images. Full screen mode gets the same upgrade: all three Inspectors combined in a single heads up display. Aperture 2 has a cleaner layout that combines the Projects, Metadata, and Adjustments inspectors. The interface changes may seem simple but they make longtime Aperture users like myself happy. The interface in previous versions of Aperture had the Browser in the middle, with the Projects Inspector on the left side and the Adjustments Inspector on the right side. The Metadata Inspector could be toggled on and off to fill part of the Adjustment Inspector’s panel. On a 20-inch screen, there wasn’t enough space for image editing. I constantly toggled combinations of the three inspectors on and off, never needing two at the same time. Now, in Aperture 2, I just press “W” on the keyboard to cycle through the inspectors, and I’m getting used to (and liking) having all the inspectors unified in one part of the screen. In the same vein, pressing “V” on the keyboard cycles through Browser, Browser and Viewer, and the new Viewer only mode. It’s the kind of tweak to Aperture’s interface that users will really enjoy. I also like the ability to double-click on an image in the Browser or Viewer to display it in Viewer only mode, then double-click on the image again to return to Browser and Viewer mode. This last feature is customizable: within Aperture’s preferences, you can set double-clicking as a way to toggle between full screen and windowed mode, though I far prefer the default of pressing “F” on the keyboard to accomplish this. Another addition is the new All Projects view. Anyone familiar with the Events view in iPhoto ( ) will feel right at home with this feature, in which each of the projects in the library is represented by a thumbnail. Run the mouse over a project and the thumbnail displays each of the images in the project in sequence (you can select a Key Photo that is the default image that appears in the thumbnail). It’s a nice enough trick and not a bad way to find a specific project or image. And by double-clicking on a thumbnail in All Projects view, Aperture automatically loads that image in the Browser and its corresponding project in the Projects Inspector. This is the kind of interface stepping-stone that Apple likes to include to help users migrate from its consumer apps to a pro app, and I’m happy enough to have it there for the few times I need it. 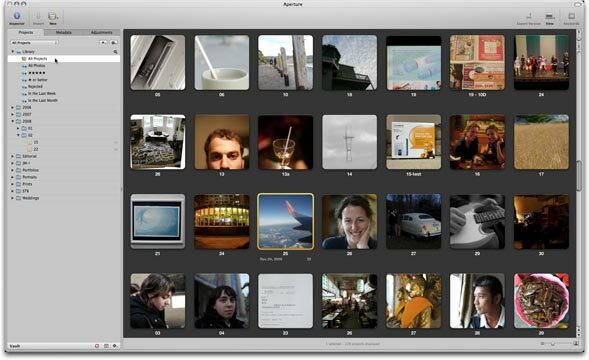 The new All Projects view will be a familiar sight for iPhoto users. The new RAW 2.0 converter included in Aperture produces an image that more accurately reflects what the camera captured, with better control of colors (yellows in particular). The advantages of shooting in RAW include having a neutral, medium contrast, and low image saturation with true baseline characteristics to start from, leaving you to make the final decisions about how the image should look. The new converter does a better job at this, with the caveat that you can’t just convert old images from the 1.1 converter to the 2.0 converter and expect consistent results. If you have a heavily adjusted image using the 1.1 converter, expect to do some tweaking if you want to bring that image to the 2.0 converter without changes. Some users may notice that the new converter leaves images looking flatter (or more neutral) by default, the same feeling some people get after making a jump from a point-and-shoot to a DSLR. What’s important to recognize is that this gives the photographer the power to process images in any direction, which is a good thing. Bottom line: the 2.0 RAW converter is a big improvement. In Aperture you can use the 1.0, 1.1, or 2.0 converters on an image-by-image or project-by-project basis. It makes sense to leave your old images in the 1.1 converter by default—unless you need tools from the new converter—and to import all new images with the 2.0 converter. The Raw Fine Tuning adjustment now includes a number of new ways to adjust RAW images. The old Boost adjustment is still there (to increase color contrast), but a new Hue Boost adjustment has been added to control how colors shift (or don’t) as Boost is applied. This is an important feature, as small shifts in color can look great in certain images but downright nasty when it comes to skin tones. The new Definition and Vibrancy tools are of the same type as Hue Boost, allowing more control over standard adjustments. The Definition tool increases detail to low contrast parts of your image. The Vibrancy tool can saturate undersaturated colors if pushed to the right, or desaturate saturated colors if pushed to the left. Skin tones are supposed to be left alone by the Vibrancy tool and for the most part this seems to work. The Vibrancy tool leaves skin tones alone while boosting or knocking down saturation elsewhere in the image. The Recovery tool (which would be better named the Highlight Recovery tool) allows users to get extra highlight detail from RAW images. Highlight detail in general seems better in Aperture anyway (fewer blown whites), so the addition of this tool only sweetens the pot. 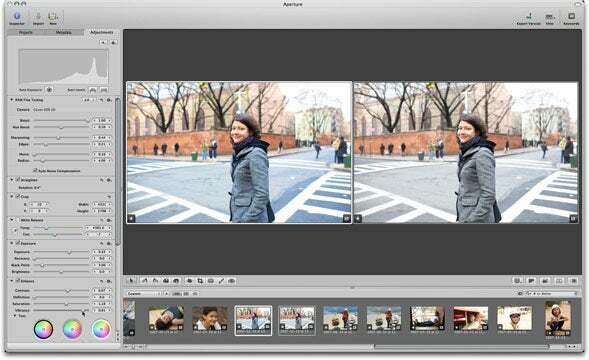 A big selling point with Aperture is a new Retouch tool that includes a clone and stamp function. The Retouch tool is great for minor clean-ups, easier to use, and not as computationally intensive than the older Spot & Patch from earlier versions. For any serious editing you’re still need an external editor like Adobe Photoshop ( ). The Moiré tool will draw blank stares from most users. Moiré is an interference effect that shows up in images of heavily patterned objects (like certain fabrics or brick walls) shot by cameras with weak or no anti-aliasing filters—mostly medium format digital backs. Moiré removal, like tethered shooting (another new feature) is an addition mostly geared towards the high-end professional. What is not as well documented about the Moiré tool is that it replaces the Chroma Blur tool, making it useful to remove high ISO noise as well as the moiré it is named after. Aperture finally includes a Vignette tool, giving you the ability to adjust the darkness of the edges of a picture. 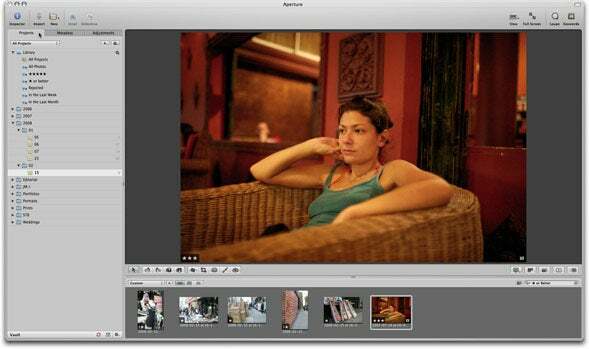 When you vignette and crop an image, Aperture applies the vignette after applying the crop. A lot of other programs do the reverse, reducing the ability to vignette the cropped portion of an image. As they are implemented now, Vignette and Devignette both offer Amount (strength of effect) and Size (how much of the image is effected) sliders with positive values. Having two separate tools for this is about as logical as breaking the Contrast tool into two: one tool to increase contrast and one to decrease it. The Vignette tool also offers the choice between Gamma and Exposure vignetting. The Exposure setting only changes brightness; the Gamma setting changes color and contrast in some pre-ordained way. But there’s no reason this should prevent Apple from combining the tools. I’d also like to see a lens correction tool (for pincushion, barrel, perspective, mustache distortion, and chromatic aberration) like Bibble includes, and more frequently upgraded support for new (and old) camera models like Adobe provides with new versions of Adobe Camera Raw. 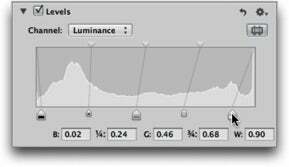 The Levels tool that Aperture 2 uses is not as powerful as the Curves tool (Adobe Camera RAW) for the adjusting tonal values of your image. Please, Apple, include this in the next release. That brings us to the question of how frequently Apple updates RAW format support for new cameras. Most other programs handle this at the application level, but because of the way Mac OS X decodes RAW files at the operating system level, new cameras are supported via OS updates, not Aperture updates. This has caused sizeable delays between the release of a shiny new camera and Aperture’s ability to fully support the RAW files the camera produces. Apple says that Aperture will import RAW files (“generated by most cameras”) that are first converted to DNG files (an open-standard file format controlled by Adobe), but this does not promise the same quality as a fully-supported camera. Only time will tell if this is still a problem or just an empty worry. Aperture still doesn't have a tone curve tool. The Levels tool comes close, but lacks the complete control over tonal values that curves adjustments allow. There’s no reason for this to be missing. Some may be disappointed by the lack of tools for localized, selective edits. Such tools are out of the scope of Aperture’s purpose as a photo management program with tools for tweaking RAW files. Think of some of Aperture’s tools like Retouch as the lowest of the low hanging fruit—Apple includes some tools (the notable exception being the tone curve) in order to eliminate the need for very basic localized things. Photoshop is still the better tool for such edits. Aperture 2.0.1 delivers on the promise that Apple set out on when Aperture was first released in 2005. For $199 ($99 upgrade), Aperture is probably the cheapest tool in any professional photographer’s quiver—a tool that can cut image organization and adjustment times immensely. Aperture isn’t perfect, and it’s not the only solution out there for organizing images or making RAW image adjustments. But it’s easy and fun to use, and an incredibly powerful tool for the professional or serious amateur photographer.